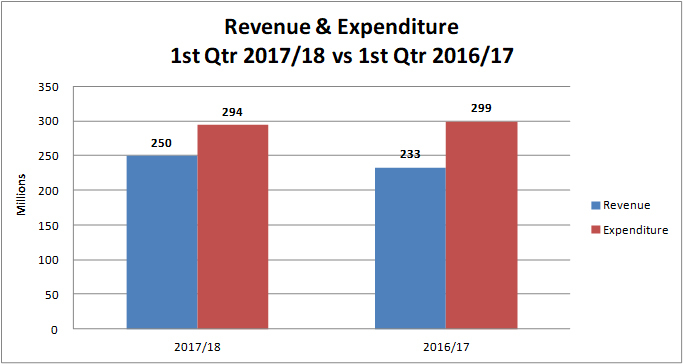 The Ministry of Finance today [Aug 24] reported on the 2017/18 First Quarter Fiscal Performance, saying that revenues for the first quarter ending June 2017 are $249.9 million; current account expenditures, excluding debt service, for the first three months ending June 2017 are $232.3 million; and gross debt at the end of June 2017 stood at $2.494 billion. “The headline numbers for the 2017/18 National Budget were: a revenue target of $1.04 billion; current expenditure of $1.11 billion, including debt service; capital expenditure of $67.5 million; and a projected deficit of $134.7 million,” the Ministry said. “Revenues for the first quarter ending June 2017 are $249.9 million; this is $16.7 million [7.1%] higher than in June 2016. 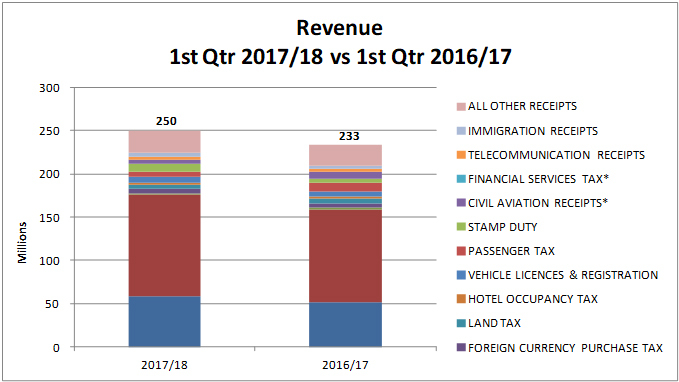 “The primary reason for this increase is due to an increase in Payroll Tax collections of approximately $9.9 million above 2016 collections, higher collections in Customs Duty of $7.8 million above 2016 collections and higher Stamp Duty collections of $4.8 million above 2016 collections, offset by lower collections in Passenger Tax and Civil Aviation receipts due to the privatization of the Airport and the transfer of Department of Civil Aviation out of the Government. “When compared to Budget estimates, total revenues are tracking higher. However, not all taxes and fees are collected evenly on a monthly basis so the quarterly comparison should only be used for a rough guide. “Current account expenditures, excluding debt service, for the first three months ending June 2017 are $232.3 million; this is $5.3 million [2.2%] lower than was spent during the same period last fiscal year. “Government current account spending to date is lower during this fiscal year when compared to the same period last year mainly due to decreases in staff costs, transportation costs, and Professional Services costs, following the transfers of the Departments of Civil Aviation and Maritime Administration out of the Government. “Capital account expenditures for the period ending June 2017 are $15 million which is marginally above the 2016/17 spend for the same period. This is due to increased capital grant amounts for the America’s Cup. “Debt service costs for the first three months ending June 2017 are $46.5 million. This represents $31 million in interest payments and a $15.5 million contribution to the Government Borrowing Sinking Fund, representing approximately one quarter of the $62.1 million annual contribution. “Debt service to date is about $300 thousand less than last year’s period. This is due to the Government restructuring its debt in 2016 by paying off more expensive debt and issuing cheaper debt. 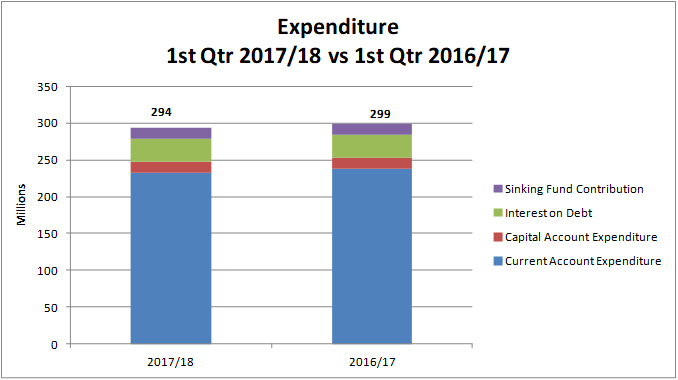 “Overall, total Government spending for the first quarter of fiscal 2017/18 was $5.3 million, or 1.8%, lower than the corresponding period in 2016/17. “However, it should be noted that in the course of Ministries’ budget monitoring and control exercises they have reported to the Ministry of Finance a number of additional expenditures in current account expenditures in 2017/18 – Mainly due to unbudgeted expenses incurred for the Americas’ Cup by the former Government. “For the first three months of 2017/18 Government incurred a deficit of $43.9 million. This deficit was financed by drawing funds from an HSBC Credit Facility and with working capital. Scary numbers. Let’s balance the budget. PLP, please make balancing the budget the top priority. You may have to make some tough cuts that anger your base, but the budget must be balanced to be able to tackle the debt. Oops. The OBA spent less and earned more. Terrible record. While we have moldy public schools with no internet/wifi/cpu classes…and 72 buses out of 106 out of service…great record OBA clap clap! All the fault of the Civil Service not doing their jobs. Almost a hundred days! Shouldnt all bermudians be back at work.???? Dunkley should be congratulated for getting the Cabinet building ready for Premier Burt …..
On time and on budget by the ….. Wait for it ….. The Works Dept.